It is important to have fresh food in our diets in order to reach optimal health and the same goes for our dogs too. There are a number of ways, with a little effort that you can increase the nutritional value of the food you are feeding your dog. It is also an ideal way of starting to introduce fresh food if you are thinking of changing over to either a raw or home cooked diet. The top left photo shows homemade Bone Broth which can be frozen in ice cube trays. It is a great source of glucosamine and chondroitin for joint health and very soothing for the gut. The Hedgerow Hounds herbal blends are a quick and easy way to add a vast array of vitamins, minerals and fibre. They are of the highest quality and have been approved by our holistic vet. There is a blend to suit every dog and every season throughout the year. They can be fed dry, re-hydrated or as a tea. Great to use in your treat recipes or in a vegetable smoothie. Oily fish is a real treat for some dogs but others are not so keen. If they don't like raw or lightly cooked fish then tinned mackerel or sardines will still provide a good source of Omega 3 fatty acids. Most dogs love these and they are perfect to have in the store cupboard. Throughout the year there are a number of wild growing ingredients you can pick for your dog such as a few dandelion leaves, cleavers, chickweed, rosehips and blackberries. These can be added to their vegetables or treat recipes. Just make sure you always know exactly what you are picking and it is from an area free of traffic pollution and agricultural sprays. Eggs - Either raw or very lightly cooked will provide a huge range of nutrients all in one perfect package. Talking of the shell, the inner opaque membrane can be removed and fed providing extra nutrition for joints and ligaments. If you want to add vegetables and berries to your dogs meals then a good way to do it is by making a smoothie which will assist the digestion of vegetables by breaking down the tough cellulose wall that plants naturally have. The ingredients shown are packed full of anti-oxidants for a real boost to health and the immune system. Make a tea with one of the Hedgerow Hounds herbal blends and add that to the veg before blitzing in a blender. The inclusion of pulped vegetables also adds welcome moisture to dry food. You can set aside some vegetables when you are preparing your dinner and either blend or steam them to add to you dogs meals. Broccoli stalks, green beans, courgette, kale are all good choices rather than starchy root veg. Rotate the vegetables fed and include seasonal variations. In Autumn you can pick your own blackberries or my dogs actually help themselves from the low branches. Freeze some for later in the year or you can add a few blueberries or raspberries for a vitamin C boost. Medicinal mushrooms such as Reishii, Shiitake, Chaga, Coriolus have immune bosting and anti inflammatory properties and recent studies have shown them to have positive anti- tumour benefits. If you cant find fresh then the dried versions can be re-hydrated with hot water. 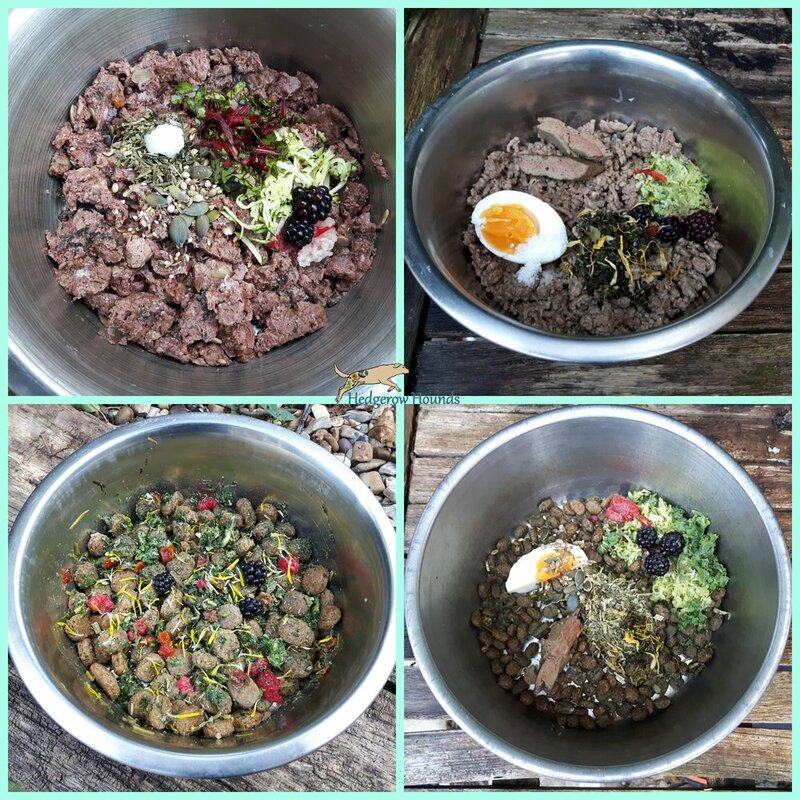 Kibble, tinned and home cooked meals can be improved on by adding a few berries, seeds, Hedgerow Hounds Herbal Blends and vegetables. Little changes at the speed your dog can easily adjust to is a big step in improving the health and wellbeing of our dogs.